Often we find ourselves scrounging metal for projects. If you are making anything you want to hold an edge you need something with some carbon in it. For decades the quick test was to grind on it and look at the spark pattern to determine what kind of metal it is. In the September 1959 issues of Popular Mechanics has one of the best write-ups I’ve seen and it even has some good color pictures. Learning the properties of various types of iron will really help you in any projects you work on. Low carbon steel will not harden like high carbon steel, but it is tougher and will not crack as easily. This is why blacksmiths of times past would weld in a piece of high carbon steel for the edge of an axe. The high carbon steel would harden and hold an edge while the lower carbon steel in the back would hold up to the stresses on the eye and pole of the axe. The best way to learn this is to grind know types of metal and learn the spark pattern. If you can’t do that then the article linked to above gives you a good starting point. Other than learning to tie your shoes I suspect that most of us have not spent much time learning how to tie knots, or more importantly what knot should be used in what circumstances. I think the only knot I know how to tie is the basic half hitch, which is really only useful for limited applications. Further if what you are doing with the knot is important (maybe even your life relies on it) then knowing the proper knot is equal impotent. There are different knots for tying a rope to an object, tying ropes to each other and also how easy you want it to come apart. Back in the early 80’s I spent a lot of time in Metal Shop and one of the things I thoroughly enjoyed heating metal up to red-hot and bashing it with a hammer. Now it is 30 years later and I have assembled the pieces to do blacksmithing again. The hardest item to find is the anvil which is described as “The only item the Blacksmith cannot make himself”. All other pieces of a blacksmith shop, such as hammers and tongs and even the forge can be made by the Blacksmith. 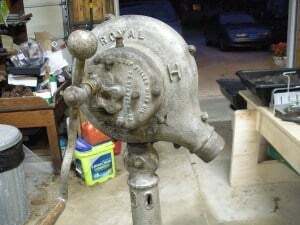 I let people know I was looking for an anvil and after a couple of years my father-in-law called and let me know he saw an ad for an anvil, tongs, leg vise, hand crank fan and forge. It even included 400 lbs of coal. I hauled this collection of stuff from South Carolina to S.E. Michigan and now I have to figure out how to set it up someplace. I’ve never had a hand crank blower before and am having trouble figuring this one out. 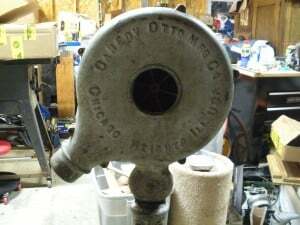 This one says “Canedy Otto Mfg Co – Chicago Heights Ill USA” on one side and “Royal Western Chief H” on the other. 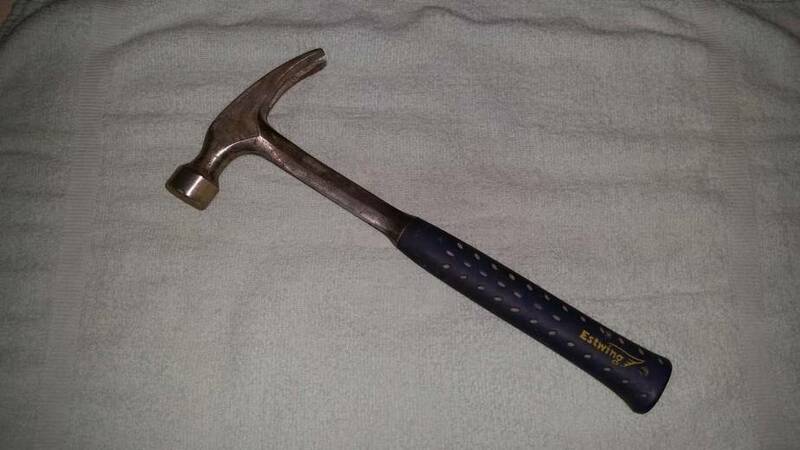 I am uncertain the last time it was used but the handle turns freely. It also says something like “Keep filled with Oil” so I have to find out how much and what kind of oil. I’m going to try the forum at http://www.iforgeiron.com and see if I can get some help. Another older post from a blog I’m shutting down. We ordered the 18″ machete from knifekits.com which ended up being less than $30 including shipping. This is a complete kit including the handle and hidden bolt fasteners. The blade is covered with some kind of goop to protect it so I used acetone to clean the area under the handle. The wood handle had to be drilled out a little to accept the hidden bolt fasteners and then we did some filing on the back side of the blade. So far this is looking to be a much better quality machete for only a few dollars more than what can be purchased locally from a hardware or sporting goods store. 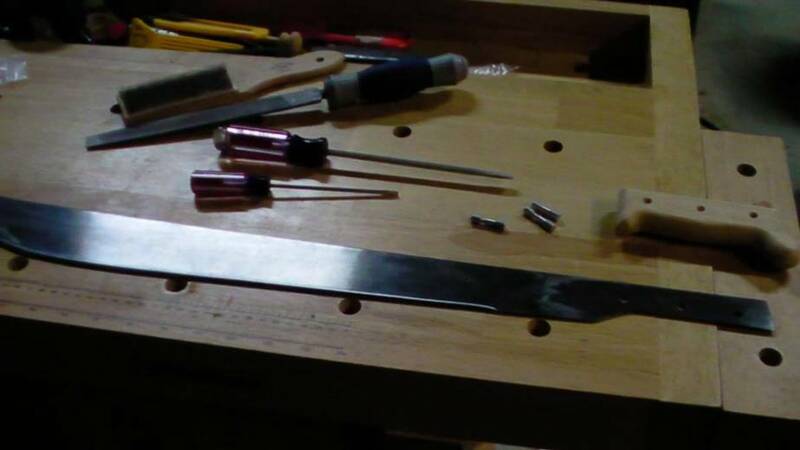 My son also got a real kick out of “making” a knife. Note that we did take a shortcut and drilled out the handle so the entire hidden bold fastener went below the surface of the handle. 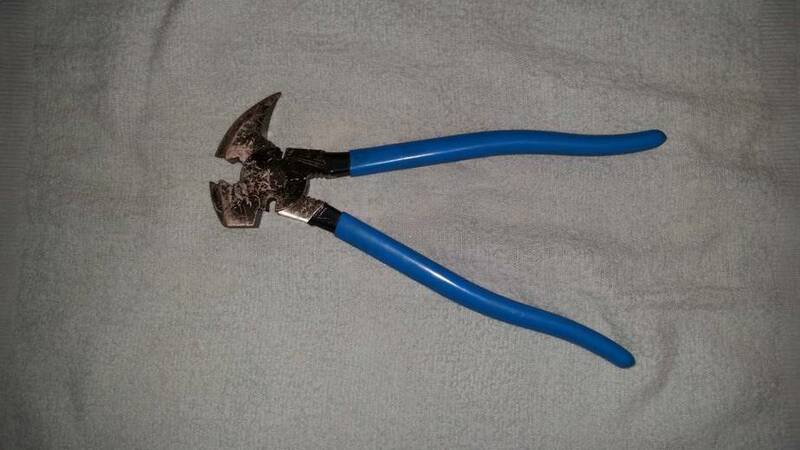 Normally you would tighten them up and file them smooth to the surface of handle. A post I made several years ago on a different blog. 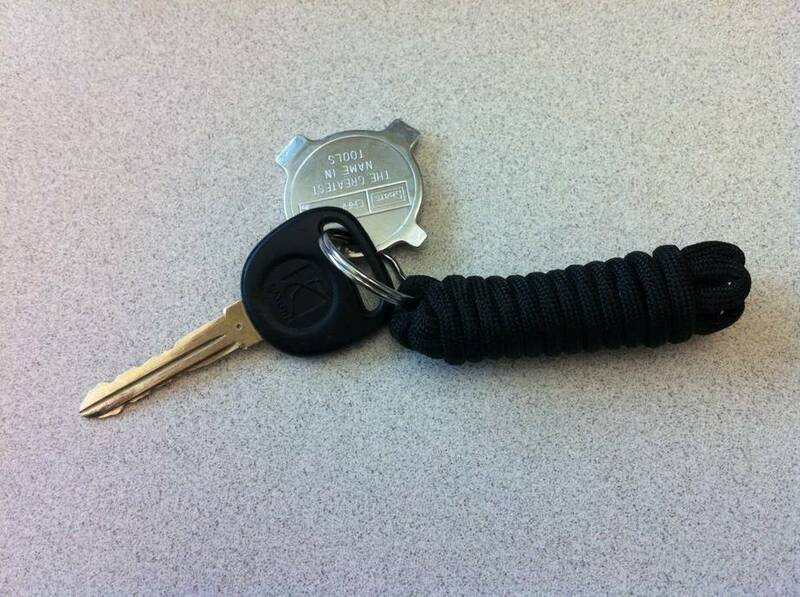 Doing things with paracord has become very popular. 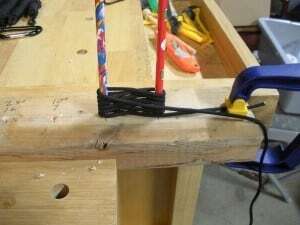 This lesson will show you how to build a simple jig that will make tying the paracord bundle or fob much easier and how to tie a length of paracord into a small package that can quickly be undone. There is a YouTube video at the bottom that shows all of this as well. Using your ruler and pencil or sharpie measure from one end of your board and make a mark at 4″, 6″, 8″, 10″ & 16″. You want these marks to be in the center of the board. Select the drill bit the size of your pencils and hold it next to the board so that the point is a little higher than the bottom of the board and put a piece of tape on the bit even with the top of the board. This is your depth indicator. Put the bit in your drill and drill the holes, stopping when the tape reaches the top of the board. Try to keep the drill a vertical as possible, this is called plumb by carpenters. Put the pencils in the holes and you are done. The advantage of a jig for anything is repeat-ability. In this case you can learn how many wraps each length of paracord needs to come out correctly. I’m not even going to try to explain how to use the jig, watch the video. However I did list the settings I’ve found to work at the bottom. You may need to adjust them for the way you tie, but this will give you a starting point that should at least work. The first hole always gets a pencil and 2nd pencil is placed in the hole that corresponds to the length of paracord you are using and then wrap the number of times indicated. Again see table below the video for the values that worked for me.